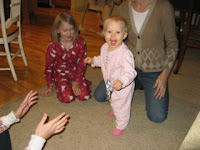 2011 in the Cole Sorority: Look who is Walking! This little miss is on the move. She took her first few steps about 10 days ago and gets a bit more brave every day. The girls love to play the walk back and forth game. She can stand herself up and will transfer between chairs or other things that are close together, but if it's more than a few steps away, she still prefers her speedy crawling. She gets up and down the stairs without any trouble at all, and has even tried to walk down the stairs while holding onto the bannister. That makes me a bit nervous. She'll be running in no time.